Albany City Hall was designed by Henry Hobson Richardson in 1881 and constructed between 1881 and 1883. 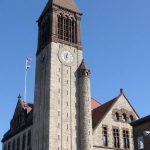 Designed in the iconic style that would later become known as Richardson Romanesque, Albany City Hall incorporates many of the elements of H. H. Richardson’s other notable structures including rough-faced exterior stone walls, contrasting trim stone colors, arched door and window openings, grouped rectangular windows, roofline broken up by numerous gables, dormers and chimneys with a prominent tower incorporated into the building. At Albany City Hall, the three-story structure is constructed of Milford (MA) granite with East Longmeadow (MA) brownstone used for trim and ornament. The clock tower, situated at the southwest corner of the building, rises 210 feet from the street and is predominantly composed of granite masonry with the exception of the belfry and roof levels. The belfry and roof of the Albany City Hall tower are constructed of East Longmeadow brownstone, with corbelled brick back-up used at the interior of the roof. At the belfry level, each façade has a group of three bi-partite arched openings with acanthus leaf ornament used at the capitals of the mullions and corner columns and at the cornice below the roof. 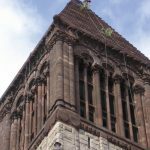 At the exterior, the pyramidal roof consists of 22 courses of bush-hammered brownstone blocks topped by a decorative stone finial. Documented condition of the brownstone masonry at the exterior of the roof and belfry levels. Assisted with water infiltration study.